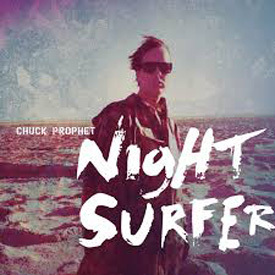 If this album had been released two years ago; or even one year ago it would rightly be acclaimed as Chuck Prophet’s best ever album; and would be on many people’s Album of the year list; but as it is NIGHT SURFER has to suffer the ignominy of being the follow up to the genre defining TEMPLE BEAUTIFUL and sadly has to bare such comparisons. The album opens with the Sticky Fingers era Rolling Stones influenced Countrified Inner-City Technological Man; that sounds like Prophet is giving the finger to his previous Masterwork, with the beat pounding along; defying you not to dance to it as the singer screams out the chorus; and to my ears; the is song is a wholesale joy. We are quickly back to familiar ground with Wish Me Luck and Guilty as a Saint which are as intricately clever as anything on his previous albums and both have been staples of the recent tour; standing shoulder to shoulder with his best ever songs. Later on we get Laughing on the Inside and Ford Econoline which have also had numerous outings this year; but Laughing on the Inside if listened to on its own is staggeringly wonderful and already in my Top 10 songs of 2014. The dirty guitar intro to Felony Glamour and Lonely Desolation with its Beatlesesque melody will transport many fans back to the halcyon days of Prophets previous incarnation in Green on Red; which is definitely no bad thing in my book. It’s no great surprise that a couple of tracks score lower on the chart; with If I Was a Baby being an okay song swathed in swooping strings and orchestration; but it still doesn’t mask a song that needs a bit more work. On Truth Will Out the ‘everything plus the kitchen sink’ production coupled with Prophet attempting something of a Dylan ‘drawl’ doesn’t do a very good song any favours; but there’s plenty of great other songs surrounding them to make these faux pas’ forgivable in every sense. Love is the Only Thing, which closes NIGHT SURFER opens with a Buddy Rich style drum solo and follows with a nod in the direction of the Osmond’s Crazy Horses before we get to yet another classic Chuck Prophet definitively Alt. Country Rocker that puts all of his contempories to shame. As a standalone album NIGHT SURFER is bloody good; just try not to compare it to TEMPLE BEAUTIFUL……but it won’t be easy.